Arrived at Corfu on Wednesday 2nd June after a very early flight, tired because take off was delayed for over an hour because one of the stewardesses decided she was not feeling well just as our plane was about to take off. A short taxi ride to NAOK yacht club took us to our meeting point and soon after NINE LIVES was along side the quay and we and our luggage safely on board. 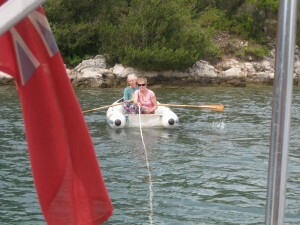 We motored to close to Lidl and Sue and Francesca went off to buy groceries. Next we sailed to a fuel depot and filled up with diesel. Then to a nearby anchorage and early bed. We were woken before dawn by thunder and lightening. After a while we heard Mark and Francesca get up. Then we heard the anchor being brought aboard and the engine started. Both of us desperately tried to catch up on our sleep but the motion of the boat which by now was slamming into a choppy sea, made this difficult. 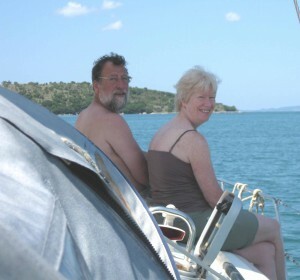 The storm had passed over by the time we surfaced but M and F had agreed to meet some friends at Igoumenitsa on the mainland some distance away and had previously decided on an early start. Sue and I were like zombies but F made us some porridge and hot drinks for breakfast. Unfortunately Sue didn’t keep hers down for long [very unlike her]. The wind veered, sails were hoisted and the engine shut off. Greek salad and potatoes for lunch [Sue didn’t have any] and Mark started his instruction with the electrics. 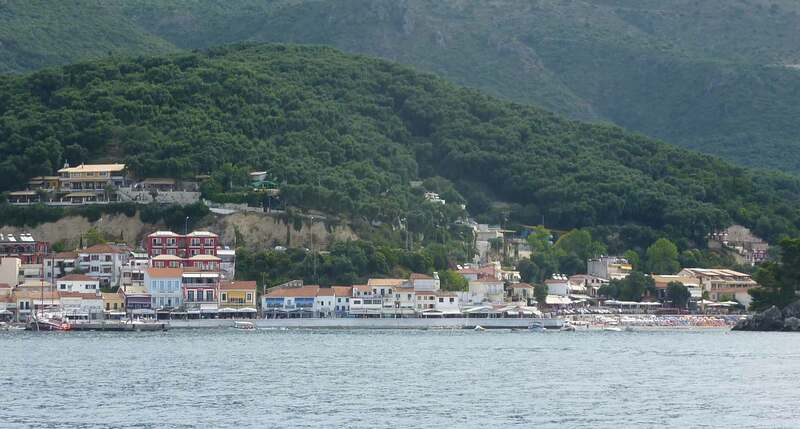 Igoumenitsa is a busy ferry port and we arrived at the same time as F and M’s friends ferry. F and I went ashore and soon we had picked up the stuff the friends had brought and up anchored. 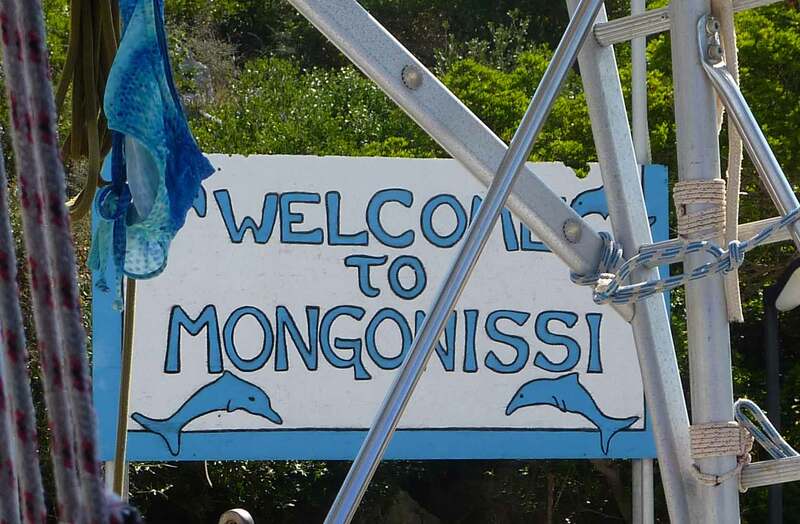 We sailed to a lovely bay about an hour away and after a supper of beans, potatoes and steamed veg played a game of train dominoes until far too late. Woken up by the sun streaming through the windscreen above our bed after a very comfortable night’s sleep and soon heard F scrubbing down the deck, making the most of the heavy dew that had fallen. Sue was still not right but at least managed to keep her food down. I made salad and coleslaw for lunch. We just chilled out most of the day but I went for a row in the tender right around the bay and also tried my hand at fishing. We saw the most surreal sea creatures that I identified as a kind of sea slug. 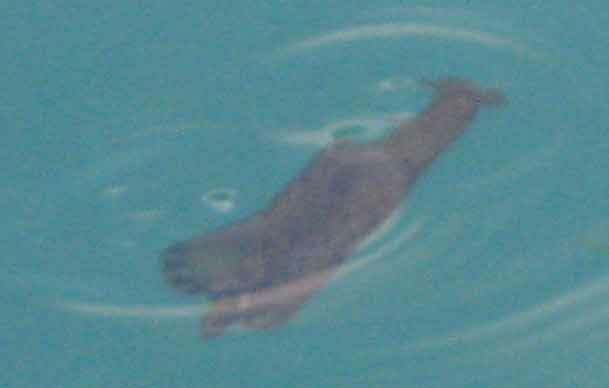 Almost 30 cm long, black with brown markings, they swam near the surface with two wings but very slowly. In the evening I tried my hand at fishing but the only bait we had was a lump of cheese. There were shoals of tiny fish about 5 cm long and shoals of grey mullet up to 40cms long. These latter swam right at the surface at times with their dorsal fins protruding and also jumped right out of the water. 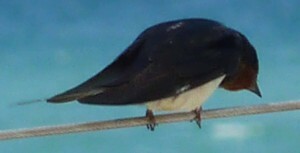 Two fish took the bait into their mouths but promptly spat it out again. In the evening we played a game of blob [hi/lo]. Woken up by rain drumming on the windscreen to a cold grey day. 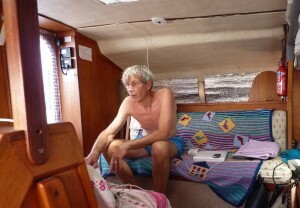 Mark made us a breakfast of pancakes and we decided to sail south as we had northerly winds. 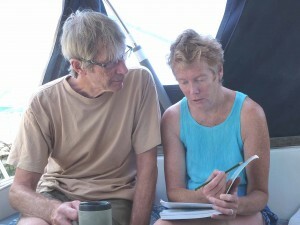 I took charge with Mark giving me advice and we sailed off our anchorage. 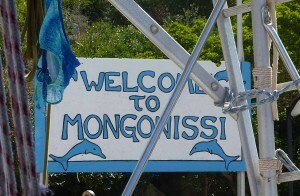 The wind was favourable all day and we sailed down to Mourtos, a small town surrounded by three small islands. 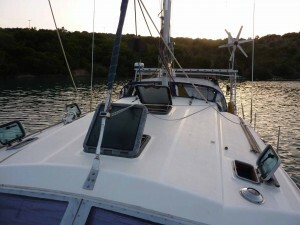 We anchored in a small sheltered bay in about 2 m ~ catamarans have a very small draught. 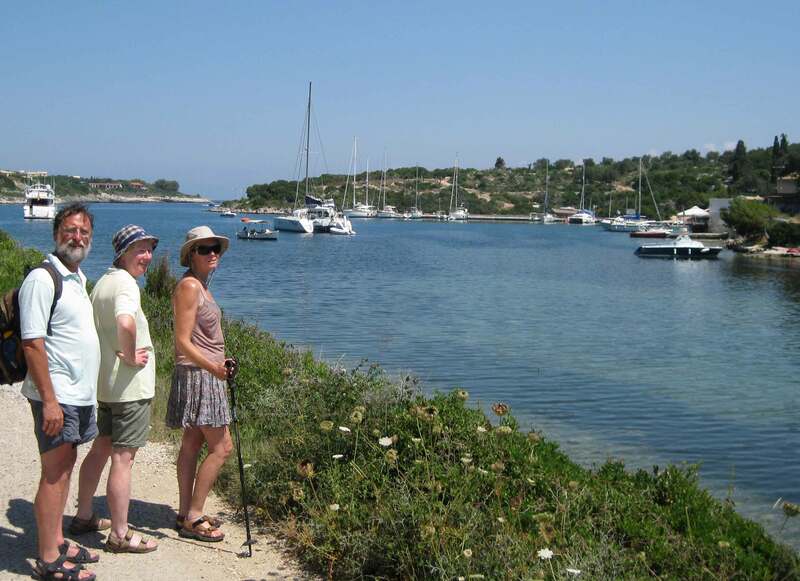 Sue and I rowed across to a bay on the mainland and then walked over a hill to the town which had a small harbour surrounded by bars, tavernas and shops. The row back was tough, being right into the wind and when we did get back Sue discovered she had left her debit card in the cash machine. 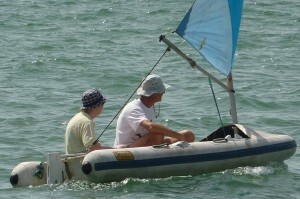 Mark put the electric outboard onto the tender and rushed her back to town. We think the machine swallowed her card but she phoned the bank anyway and cancelled her card. Fortunately my card still will work and we can get one of our visitors to bring out her new card. It was by now too late for games so straight to bed. Much warmer with bright sunshine. Sue and Francesca took the tender across to do some shopping while I wrote up this blog. We had lunch as soon as they returned and in the early afternoon we went for a swim, our first of the trip. Sue had seen a hat she liked and F some shoes so after that Sue and I rowed back to the town, got some more cash out of the machine with my card, bought the hat, an enormous rimmed black raffia affair and then sat and had a drink at a quayside bar and watched the yachters posing and making fools of themselves. We rowed back just in time for tea. I watched the sun go down from the front deck and we finished off the evening with a game of rummycup. We decided to sail north as the winds were favourable. The ladies rowed across and retrieved the line securing us to the bank and I wound in the anchor. Mark started the engine which promptly stalled. The onshore wind took us landward onto a mud bank and we were stuck. We had to pull Nine Lives off with an anchor dropped further offshore from the dinghy by winch. It was hard work and took an hour and two attempts before we were successful. The propeller had picked up an old knot of rope, hence the original problem. Nine Lives and all of us were covered in black mud. 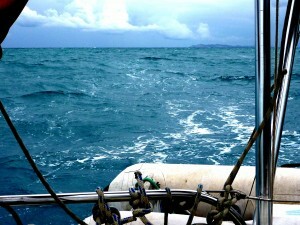 We sailed north at 6 knots with the gennaker hoisted in a very comfortable sea. For most of the day but needed the motor for the last half hour. 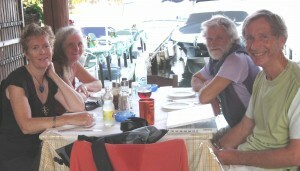 After the 25 mile trip to Agios Stefanos we decided to go out for a meal and togged ourselves in our glad rags. 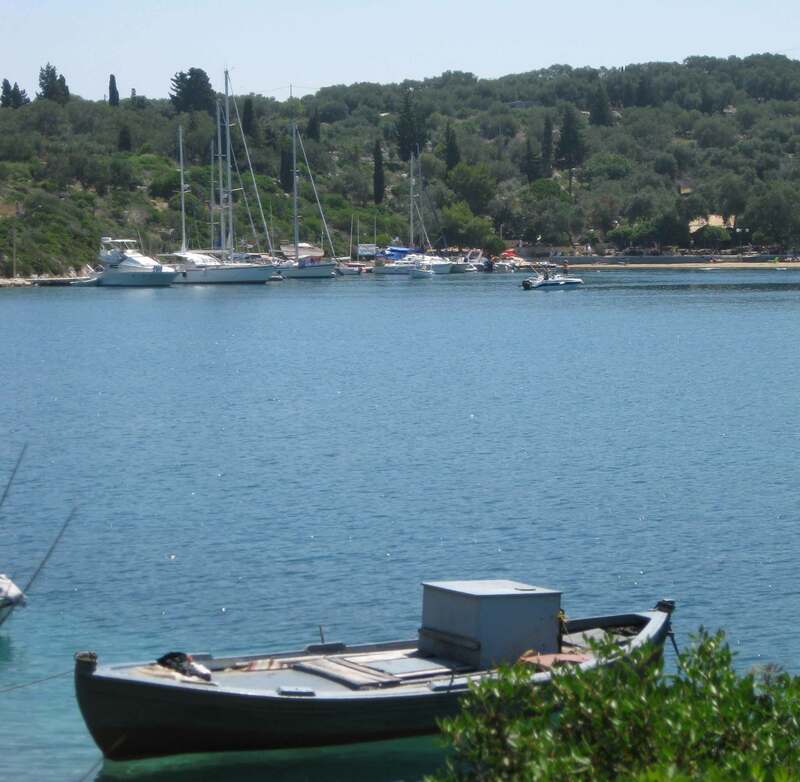 San Stefano is a lovely little place with a whole quayside filled with self~drive boats. We were accosted by a fat restaurateur who charmed us into sitting at a table by the jetty and accepting his choice of food. The Guardian article outside his place said it was the best taverna on Corfu. Before we ate I managed to chat briefly to Dougal on Skype. We had a lovely meal but my credit card wouldn’t work. We played a few hands of Uno before retiring still very full. Sue and I swam to the beach and back. I phoned the credit card bank and got them to remove the block on our cards. We also set up the internet link and rang various people on Skype and posted the first instalment of this blog. 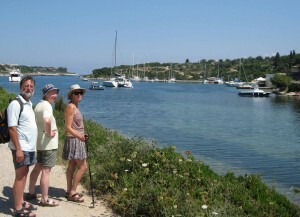 After eating several of Mark’s pancakes for lunch Sue and I set off on a coastal walk recommended by Francesca. 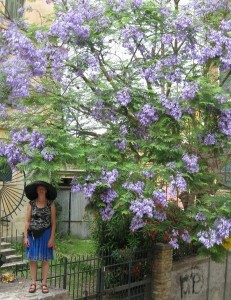 The flowers were absolutely beautiful and we were surrounded by butterflies for the first part of the walk. We got very hot and had a skinny dip on a deserted beach. Dragonflies dominated the fauna for the second part of the walk. The return journey was not so easy as we were never sure we were on the right route. It was all by road, much of it through groves of massive olive trees. In the evening F and M talked to their children on Skype. F and I took the tender across to dispose of the re~cycling and buy a few things before breakfast and after messing about a bit we set off north to inspect some bays F wanted to visit. 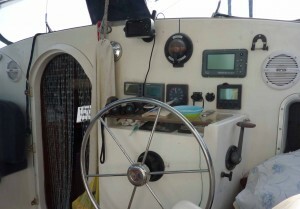 I was skipper and learned how to enter waypoints on the computer. We had to motor out of the bay but soon were able to sail. We managed to sail into the bay of and drop anchor but only stopped for lunch as it was too lumpy for an overnight stay and anyway not that attractive. I learnt how to sail off anchor and Sue learned how to raise anchor and we made notes of what to do each morning and night and what to do before we set sail. 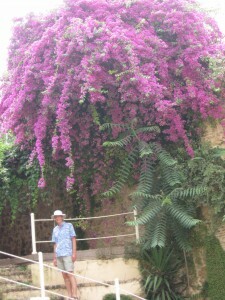 We returned to Agios Stefanos but had to motor in. I found manoeuvring the boat between the other yachts in the bay hard~the rudders are controlled by the wheel and steer the boat when it has way on it, the propeller leg is controlled by a lever that acts like a tiller. We anchored successfully on my second attempt but I was quite flustered by then with Mark giving me directions into my deaf ear and then shouting them, the ladies by the anchor looking perplexed and the boat not responding to my efforts. Sailed out of Agios Stefanos after a morning swim with very little wind so headed into the adjacent bay, Agios Kouloura. Mark had to take over anchoring here as the chain jammed and we had to start the engine. I took the tender for a sail after lunch and in the early evening Sue and I paddled ashore and had a drink and shared a platter of humous etc. and enjoyed the peace of this lovely spot. We all went for a walk north along the coast, pausing at a deserted beach for a skinny dip on the way. The flowers and scents were beautiful. On the way back our deserted beach was occupied so we had to wait for a swim until we had returned to the boat. After lunch there was some wind so we sailed across towards Albania and then back to another little cove Agios Agni. It was so hot Sue and I swam to some shady rocks and read our books there. 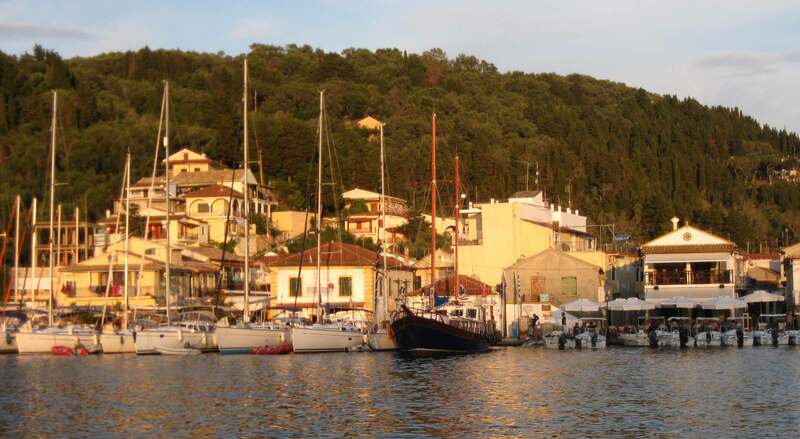 After my usual salutations to the sun, morning swim with Sue and breakfast of muesli and yoghurt I decided to row across and inspect the little town – we were moored at the other end of the bay – but it was just a collection of 5 tavernas, a few sunbeds and some power boats. Sue chatted to a lady on a neighbouring boat who came from the same area of Manchester as she did and knew Kim’s brother, Mark. Small world. We then motored out of the bay where we picked up a little wind. The ladies needed to shop so I put in a way point, set the sails and gradually approached the supermarket, which took all afternoon in the gentle breezes. 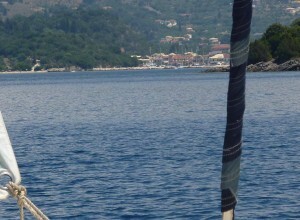 After the ladies returned laden with goodies Mark sailed the boat across to the place we spent out first night as it’s convenient for Corfu town. A day spent at anchor going through the check list prepared by Mark and Francesca so we are able to cope, hopefully, for the next three months on their own. 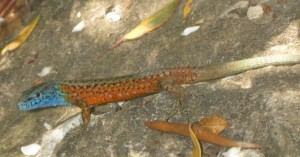 I was also able to get on line and put some pictures on the blog. Sue and I swam a long way to relax and cool down. In the evening beautiful Greek music filtered over the boat and Sue and I had a very romantic dance on the front deck. Off early and motored across to Corfu town ready for the transfer of personnel. We tried going bow on to the quay with me making a few mistakes and getting a bit het up before deciding to anchor off instead. Sue and I spent the day getting lost in it, a much more attractive place than I had imagined. We bought Francesca a magnetic bracelet/choker/necklace and a load of fruit from the wholesale fruit market and had a very expensive light lunch. Mark and Francesca were all packed when we got back but didn’t take up our offer of taking them out to dinner so I made a rice salad instead. Then we had a text from Di to say they had landed so we ferried F and M and all their luggage across to the quay. After emotional farewells and hellos we then ferried Di and Mel aboard and suddenly we were the hosts in charge instead of the guests. Neither Sue or I slept well as it was a very noisy anchorage. We got up early and motored across to Lidl, arriving before 9 am! 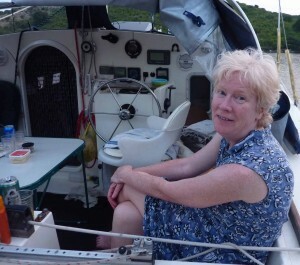 Di and Sue bought a huge quantity of food and BEER and I bought a couple of items useful for our stay on the boat, a tarpaulin to provide shade and a new mat for the cockpit. 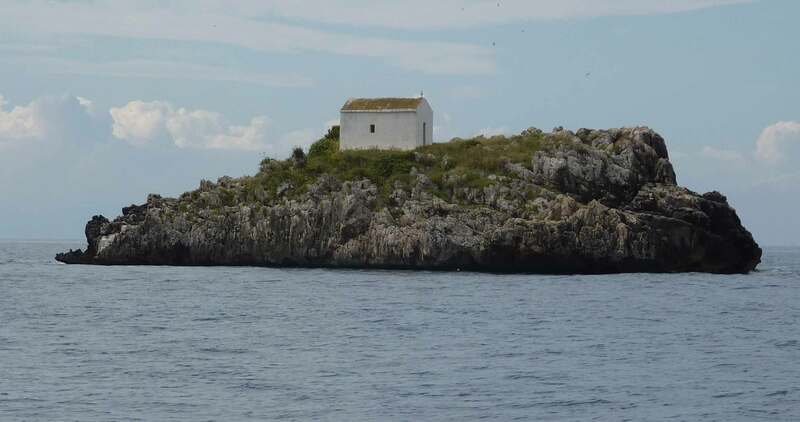 Then we set off for the mainland – 10.5 miles away. There was enough wind but not in the right direction so we set off on a tack. After two more tacks in a slackening wind the wind had veered and was in a favourable direction, but it was of very variable strength. We had a couple of mishaps, once where we went round in circles and another time when we hoisted the genika wrongly, tried to disentangle the ropes only to find the wind had swung again and it was no longer needed. 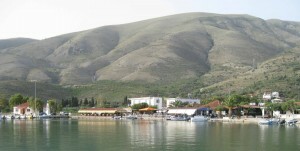 Finally, after sailing only half the distance we gave up and motored to Pagania, just on the border with Albania. This lovely bay had been largely spoilt by a huge fish-farming operation but was very sheltered and peaceful never-the less. The water at Pagania was too murky to entice us into it so we decide to try for the next place south, Sayiadha, even though the anchorage is shown as very shallow. 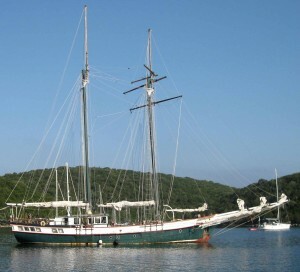 Once we had left the bay the wind was behind us and we raised the genneka again, this time successfully. Unfortunately our sail was too brief as the wind dropped again. We were so hot and totally becalmed so decided to go for a swim in the middle of the sea. Sue and Di pushed the boat for a while. 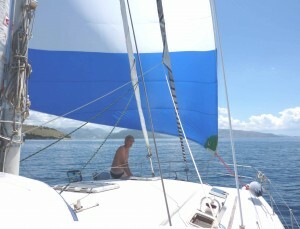 We then had lunch adrift, raising a sail halfway through to take us nearer our destination. Sadly we had to motor the last 2 miles and dropped anchor behind a breakwater. It was very hot all day and we were glad of our new tarpaulin. We swam across to a boat with a Welsh flag to wish them Bora Da and said we might meet the people at a taverna that evening. We had a feast with cold beers to start, squid, prawns, Greek salad, fried courgettes, fried aubergines and chips with retsina and ouzo. Decided to stay at this lovely little out of the way village. Collected the fresh bread we ordered the previous evening, then after In the afternoon I took Mel, Di and Sue separately for a sail in the tender a Flatacraft. Each of them wanted to learn how to sail so we did tacks, gibes etc. 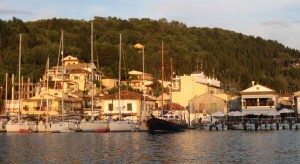 A flotilla arrived gradually but some of the yachts were too big to enter the harbour. In the late afternoon the wind got up on the beam and I was concerned that the anchor would not hold and spent some time putting fenders in place, tightening the chain, in case it should slip. Sue made ratatouille in case it didn’t drop but at about 8 pm it did and we were able to have the meal at the taverna we had promised ourselves. We spent the morning doing chores, filling up the water, shopping for a new washing line, bread and milk and I went to an internet cafe and uploaded pictures to the blog and checking emails. We had the luxury of a fresh water shower on the quayside with our new Welsh friend, Richard, who then watched us as we undid the springs, hoisted the tender, stowed the gangplank and set off. We were very pleased with ourselves as we started sailing only minutes after leaving the harbour but after several hours of frustration with the wind dropping and changing direction and us only 1.5 miles from Sayiadha we dropped the sails and motored to Ormiskos Valtou, a secluded bay we’d stayed in before. I was tired and irritable having found the journey frustrating. We ate the ratatouille, played the second half of our train game. Woken early by strong winds and rain. I rushed out naked and shut the hatches but the rain had stopped before I returned to bed. I then cut up the old washing line and made the tarpaulin properly secure to maximise the shade it gave us. 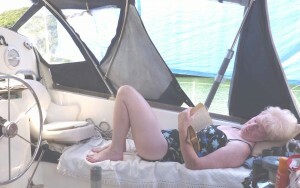 We had a day of swimming, reading and sailing the tender. Mel made a curry for tea and we played rummycup. Di and Mel decided they wanted to sleep on the stern deck even though the weather forecast forecast thunderstorms. They were just settling in when the rain started and they had to rush about closing hatches, getting bedding inside and sorting out alternative sleeping arrangements – ending up in the cockpit. Sue and I watched all this amused from our bed. It was still windy in the morning so we decided to set sail. Unfortunately our first attempt failed as the anchor chain turned the bow a towards the bank as we pulled it in and the boat failed to gybe so we hurriedly dropped anchor. We had breakfast and tried again, this time successfully and managed eventually to tack out of the bay in spite of numerous wind shifts. We put up the gennaker and started across the very busy ferry lanes only for the wind to die completely leaving me with no option but to start the engine and motor. After only 15 minutes a southerly wind struck up and I hoisted the sails again. 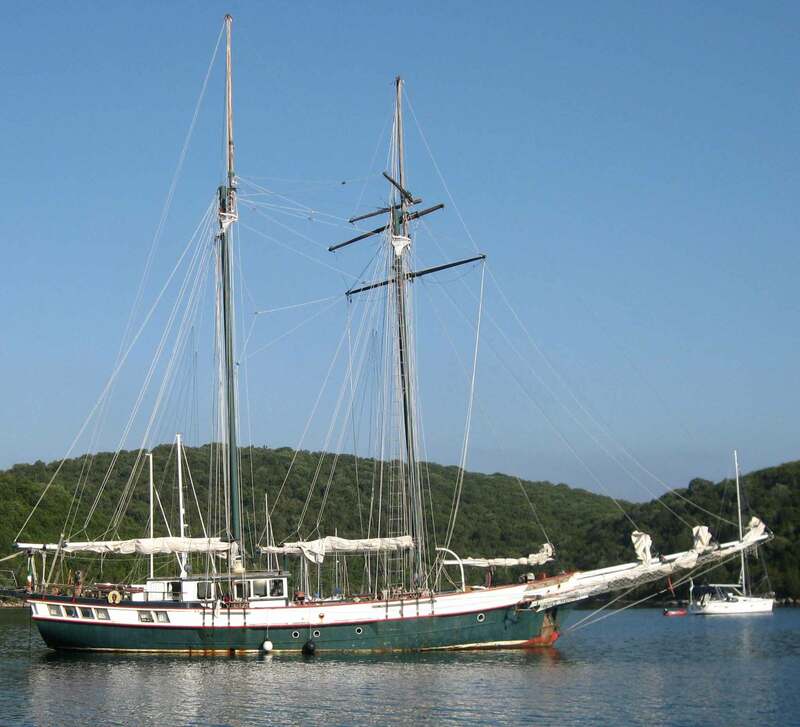 Then we had the best sail of our adventure so far, constant winds of up to 14 knots in a direction that allowed us to sail close hauled right to the port. 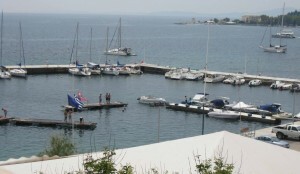 There was an ideal space for us on the town wall even though the place was full of flotilla yachts. We ate out at a quiet cafe after a long swim. They produced a macaroni dish similar to mousaka which was what Sue wanted. Woke early but went back to bed to read. Made toast in a frying pan with the stale bread. Then Sue cleaned the fridge, I bought bread and Di and Mel bought gas. Then the heavens opened. And I sorted the photos. After lunch we decided to go for a walk but we had no information on foot paths so ended up on the main road. We returned to the coast by a side road and walked along the seafront as far as we could. Then the heavens opened again and we all got drenched. After drying out, writing emails and this blog and reading for a while the wind got up blowing us directly onto the quay. One boat had to reset his and another nearly collided with the boat next to us trying to moor. It was stormy during the night and we had to get up several times to check all our mooring lines. Still windy so we decided to go on a long sail. Had to spend an hour in an internet cafe first. Left the quay in very controlled manner – so very proud. Had to motor for an hour to get out of the bay. Then we sailed all the way to Parga, 19 miles. The wind was about 12 knots so we put the gennaker up but then there was a sudden increase to 22 knots and a rush to get it down again before the wind burst it. Our maximum speed was 10.5 knots! As soon as we dropped anchor a tender came alongside and shouted ‘Have you hijacked this boat?’ He was a friend of M and F called Geoff so we invited him aboard for a beer. 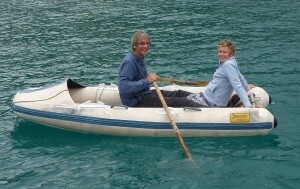 Bill and Sue both felt a little sea sick so we went for a walk to put our stomachs right. Then an omlette, another card game and bed. We had a lazy morning reading and talking to Tom and Betty and Sylvia and Dave on Skype. I spent much of the afternoon correcting errors on my blog. 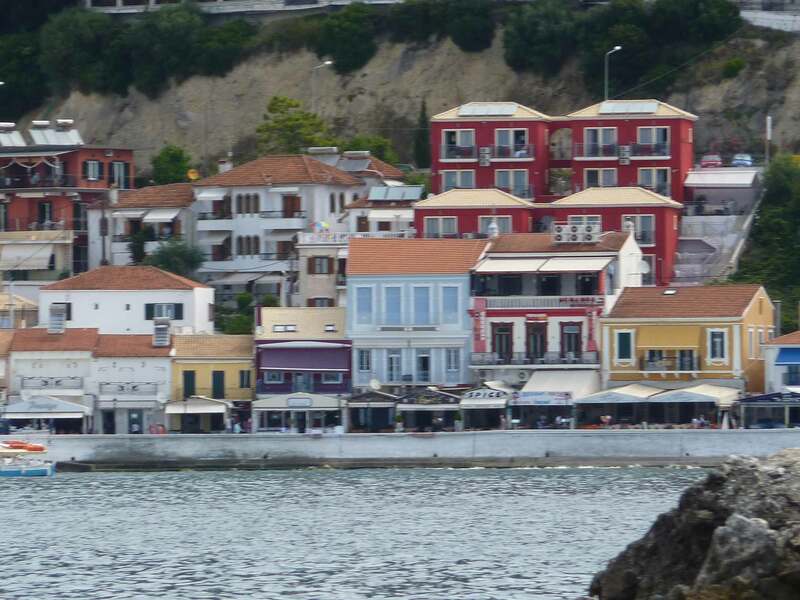 Then we paddled the tender ashore and walked into Parga, checking menus on the way. 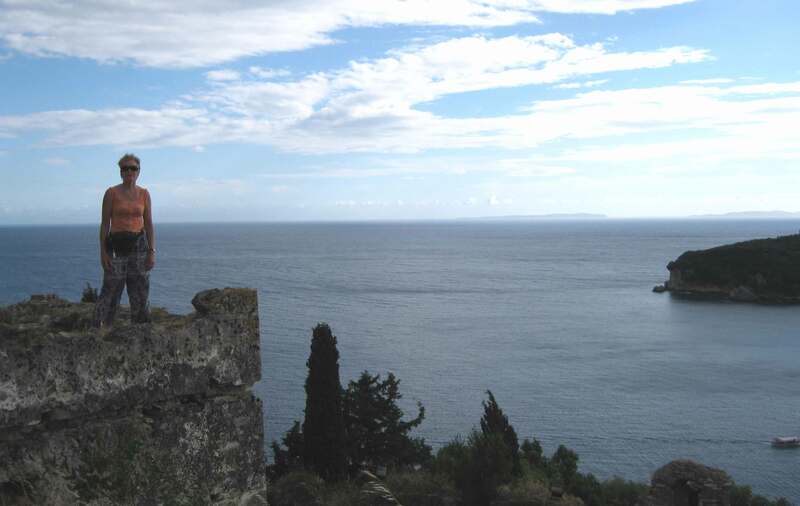 We had a look round the ruined Venetian castle, perched atop a huge rock reminiscent of Criccieth Castle then strolled between narrow streets, up and down steep inclines, just like old Mediterranean towns should be. It is a touristy place but very picturesque with two bays surrounded by wooded mountains and littered with small islands and rocky outcrops. 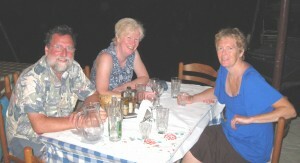 The ladies bought some fresh veg and fruit and then we sat down to eat as a busy taverna. We all had good meals and would recommend anyone else to go there. The weather forecast still predicted force 6 or 7 winds from the north west so we decided not to go far. We motored into a 1-2 knot wind from the south east to a small, uninhabited bay 4 miles away and had the whole place to ourselves for a while. 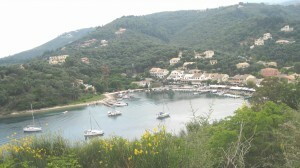 We took the tender to the small beach and walked up the hill to a small road that lead to a second beach in the bay. We also tried snorkelling but the water wasn’t very clear and there wasn’t much to see. We tried our hand at fishing but the bread just fell off the hook. The Frenchman in the other boat in our bay caught two fish by dangling bread on hooks beneath a 3” cube cork and scooping the ensnared fish from underneath with a large net. We felt little wind all day. The weather forecast again promised strong W to NW winds but we weren’t convinced. We motored out of the bay and launched our sails to a fresh SW wind. Mel was keen to do another long sail so we set off for Paxos. 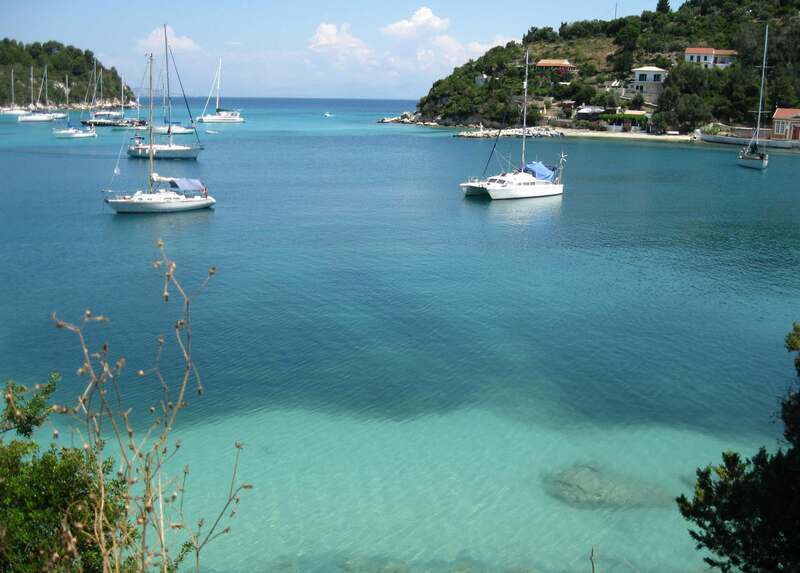 We got as far north as Parga after a couple of hours, once tacking back exactly over the same track as we’d sailed over an hour earlier. The wind strengthened and I decided we should try to use it to go north. First, however we had to sail west and the wind swung to NW. 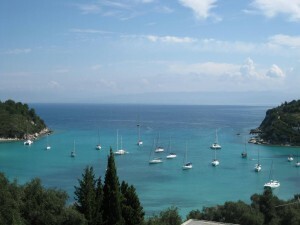 It became clear that Paxos was closer than Mourtos, the next anchorage in the north. The wind increased up to 22 knots but we had to put in several tacks to get within 1 mile of Mangonissi, our destination on Paxos. We were going to anchor but there was space on the quay so we decided to moor there instead. Unfortunately we were unprepared for this and it took a while to sort out mooring ropes, fenders and the tender while the boat was being blown about the harbour. 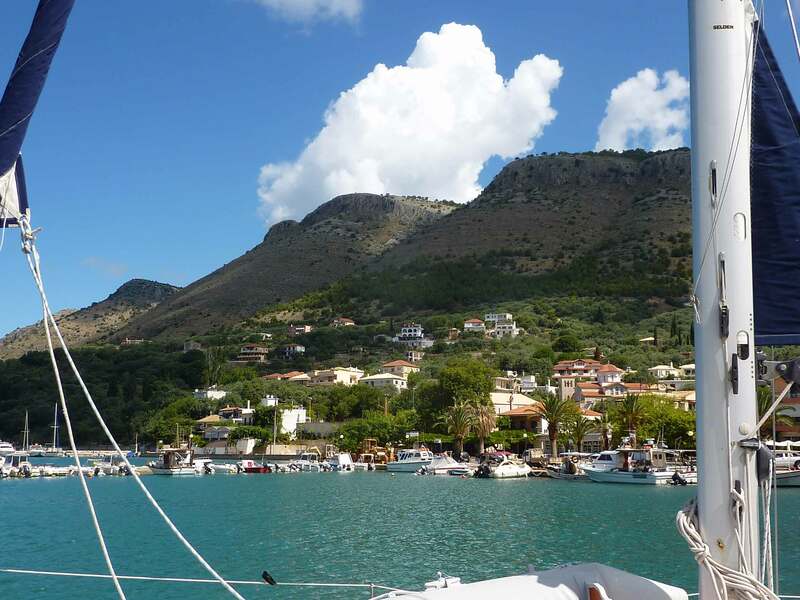 But once we were sorted we moored in a comfortable spot and soon after were supping ice cold beers at the taverna 20 metres away. As we sat there we watched them unload a freshly caught swordfish from a dinghy and all ordered that for our main course and it was delicious. What a lovely peaceful place to wake up to. 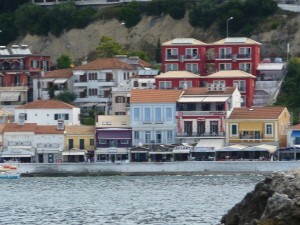 We walked to the town of Gaios about 2 miles away along the narrow coast road. 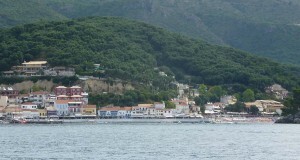 This is also sheltered by two islands but is quite commercial with many ferries bring tourists from Parga on day trips. 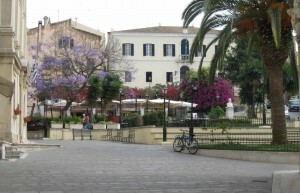 It is still a beautiful place and had planty of mooring spaces on the town quay. We had much needed cold beers and then ate a lunch of pasties sat in the shade of a tree dangling our feet into the harbour waters. It was hot walking back but the wind had started to blow as yesterday. We needed a swim off the little beach in front of the taverna to cool down. Sue and I went for a breakfast of toast. 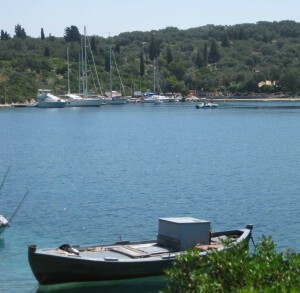 Then we set sail at about 11 and tacked up to Lakka in winds of up to 23 knots. Getting the hang of working out when to tack – add or subtract 120 degrees to current course. 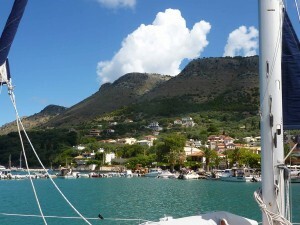 Lakka is pretty but very busy and our anchor did not hold the first time. 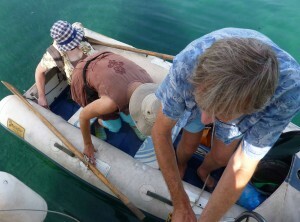 Mel and Di rescued a Frenchman whose tender had run out of fuel and we were invited over for drinks. 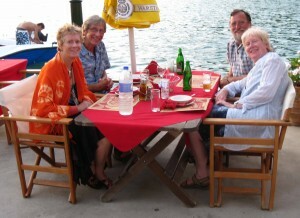 Sue chatted away amiably to our very hospitable hosts and drank a whole can of beer. 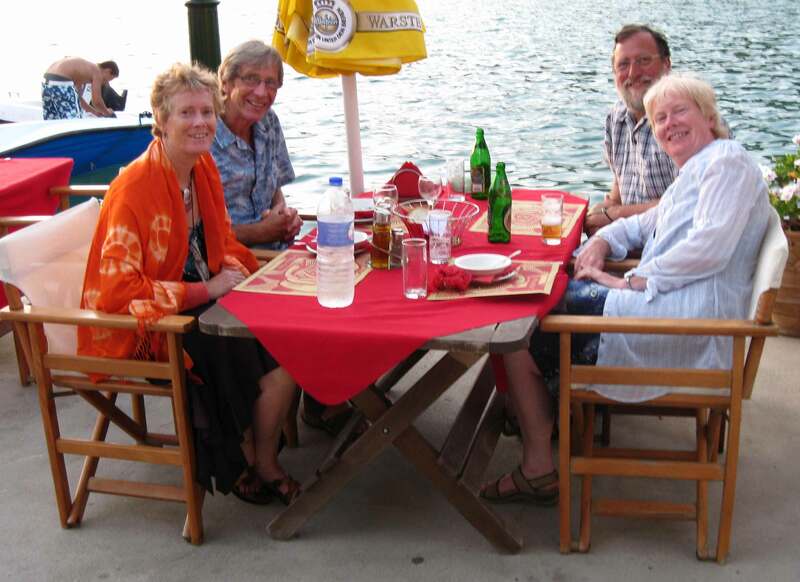 We had an all-inclusive menu for 3 at a harbour side taverna, Sue just having small mouthfuls of ours. Up early today after the ferry woke us all with its horn. 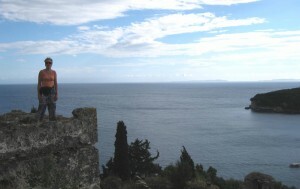 Early morning swim, followed by breakfast, a walk through the olive groves to the lighthouse and coffee at a beach café. 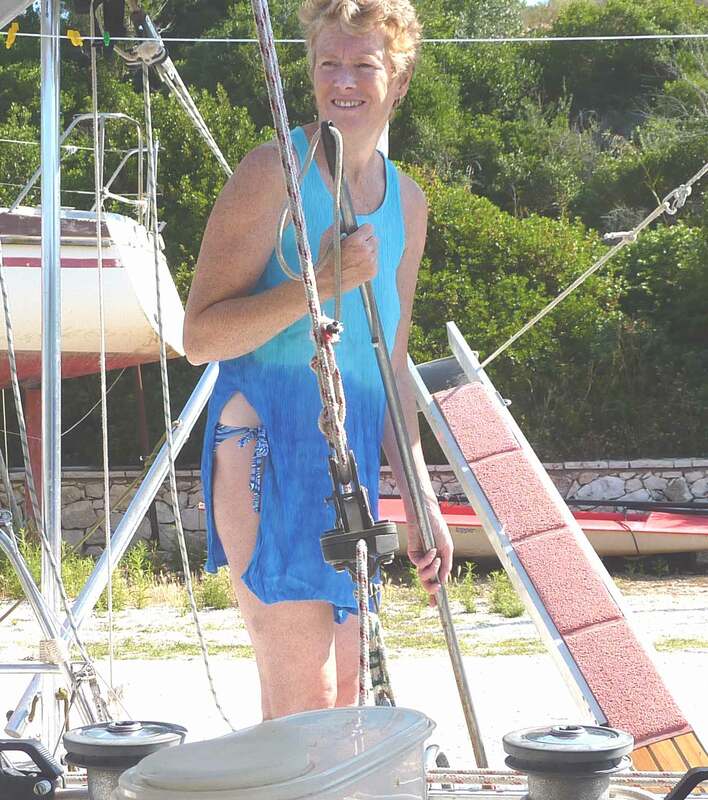 Sue bought a bikini and then we lunched aboard – tomatoes, feta, cucumber, peaches, oranges and apricots. We then lazed about all afternoon. 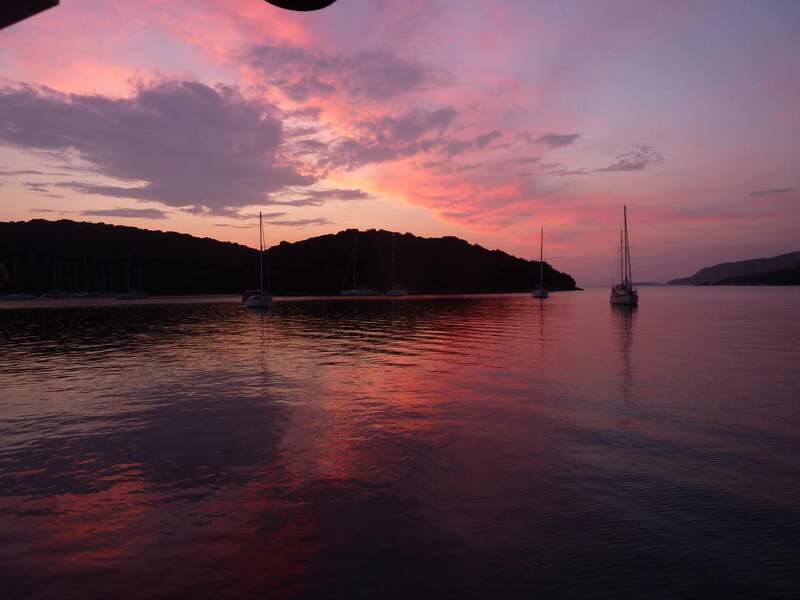 It’s become a routine now – one day sailing, one day (two nights) in port. 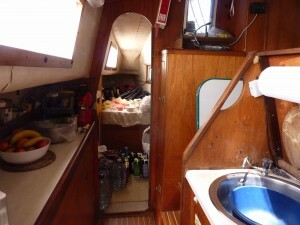 A meal aboard (another routine – one night eat aboard, one night at a taverna) followed by a game. Set off for Mourtos, on the mainland, en route to our destination of Corfu on Monday, after a leisurely breakfast, managing to avoid the yacht that had selfishly anchored so that his yacht was above our anchor. The gennaker and the steady west-south-west wind carried us all the way – a lovely gentle sail of about 13 miles. We all crashed out in the3 afternoon heat. 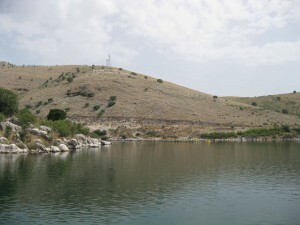 At about 6 we surfaced, had a cup of tea and a swim before we paddled and walked to the town for our taverna meal. Sue and I were up early and went for a swim, followed by our all over bath/shower. Basically we shampoo and shower gel wet from our swim, dive back in to wash off the suds, then use a garden spray to wash off the salt. It was also washing day and turn over mattress day. We went ashore late morning and after wandering round the shops and purchasing a water melon I found an internet café and had a beer with Mel while the ladies did more wandering. We had a pitta wrap called gyros at €2 each for lunch and ate aboard. 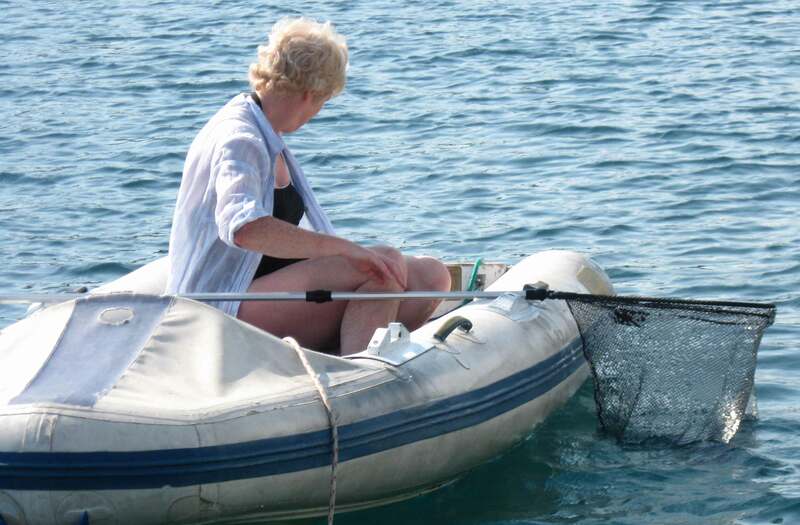 In the afternoon Di amused us all with her attempts at fishing using a plastic margarine carton with 10 hook dangling underneath as a float with her in the tender with a large net ready to pounce.